DEEP PURPLE's Ian Gillan and BLACK SABBATH's Tony Iommi took everybody by surprise in 2011 by releasing a charity single: 'Out Of My Mind', renewing the collaboration that led the pair recording the Black Sabbath album Born Again in 1984. None other than Jason Newsted (METALLICA), Jon Lord (ex-Deep Purple), Nicko McBrain (IRON MAIDEN) and Linde Lindström (H.I.M.) supported the two rock legends. Not only jamming together for the shear fun of things, this new project has united for a cause - rebuilding and helping the music school in Gyumari, Armenia. The single was a joyful and inspired moment. 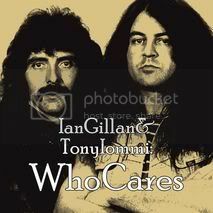 Iommi and Gillan then decided to make WhoCares an album for their devoted fans. Classic songs and a lot of rarities and unreleased material in two-CDs of fantastic rare music. This is much more than a Gillan solo album or a Deep Purple anthology – this is a real collector’s item and must have for every Ian Gillan and Tony Iommi fan. The album was released in Europe on July 13th, and will now be available in North America on August 28th. An update from Iommi states: "Many thanks to everyone who bought the WhoCares single or album, we've heard from our buddy in Armenia that construction work on the school will start on August 15th! This is just the beginning so please continue to support us! The album will be available in (North America) at the end of August, more news at that time."